Underneath a strange, body-horror plot lies a blistering Hong Kong action movie with the type of bone-crunching fight scenes that genre fans crave. Kill Zone 2, retitled from the slightly less badass sounding SPL 2: A Time For Consequences, is actually a follow-up to Wilson Yip’s 2005 film Kill Zone rather than a direct sequel, though the frenzied, bone-breaking action of the original is kept intact and even kicked up a few notches. Directed by Cheang Pou-soi, the film is a pan-Asian noir-thriller with a body-harvesting element, a twist that’s sure to capture genre fans’ attention. But underneath its gory premise lies a simple, blistering exhibition of exhilarating martial arts choreography starring the (former?) pride of Thailand, Tony Jaa, and a couple of talented, fast-kicking up-and-comers in the form of Zhang Jin and Wu Jing. The action is brutal, elegantly staged and so fast that you’ll feel your hair blow back as the kicks whiz back and forth, but it’s the woefully improbable narrative that gives the movie a strange, left-field vibe that’s hard to shake, but in a good way. Wu plays Kit, an undercover cop in Hong Kong who takes his role a bit too far, turning into a drug addict on the job. He’s ingratiated himself into the ranks of organ trafficking crime boss Hung Man-keung (Louis Koo). Kit’s guise falls apart though when a police shootout results in his cover being blown, landing him in a prison in Thailand, whose corrupt warden (Zhang) happens to work for big bad Hung. One of the prison guards, Chatchai (Jaa), is a good man working a tough job for his daughter, Sa (Unda Kunteera Thordchanng), who needs a bone marrow transplant. Chatchai discovers that the only matching donor is from Hong Kong and, as lady luck would have it, that one donor happens to be new inmate Kit. Meanwhile, Hung is in desperate need of a heart donor and may have to resort to taking his own brother’s. Chatchai and Hung’s plights converge with Kit stuck in the middle, and all hell breaks loose as the heroes and henchmen fight for their lives and their loved ones. The string of serendipitous coincidences and contrivances in the film are distractingly unbelievable (at one point, a call is made on a phone that was dunked into a harbor) and the interweaving plots and subplots are dizzying, but all grievances fade away when Cheang cuts the crap and lets the martial arts mayhem takes over. When the fists start to fly, the movie is brilliant: from a breathless gunfight at a cruise ship terminal, to a bloody warehouse butcher-knife showdown, to a sprawling prison riot (The Raid 2 comes to mind), each set piece is aesthetically unique and gloriously violent, with limbs getting broken, severed and twisted at every turn. 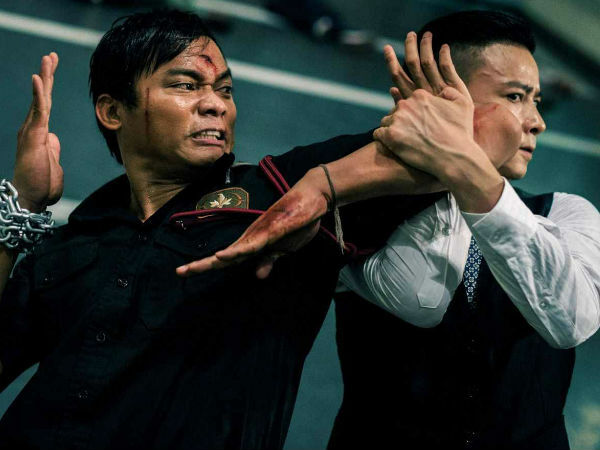 Perhaps the most striking fight scene unfolds in the third act, a two-on-one standoff in a Hong Kong high-rise that’s a veritable masterpiece of hand-to-hand combat. It’s the details of the presentation that elevate the action here, as editor David Richardson makes sure the cuts are as rhythmic as the fisticuffs, and the score nearly eschews percussion altogether, letting the crushing body-on-body contact act as the proverbial drums of war. Across the board the cast does solid work, with Jaa in particular doing a good job of selling Chatchai’s desperation. The real standout when it comes to the fight sequences, however, is Zhang, who oozes style as he swipes at the heroes with his character’s signature stabby-stabby switchblades. In movies like Kill Zone 2, the actors are almost invariably more emotive and natural when they speak their bodies rather than their mouths. It makes you wonder what a martial arts movie would look like when stripped of all the head-scratching plot lines and underwhelming scenes of dialogue. Perhaps it would resemble a choreography anthology movie similar to Wim Wenders’ excellent Pina. One can only dream.